Ground Penetrating Radar Systems, LLC. (GPRS) was contacted by a local surveying company to help identify the boundaries of a 15’ old brick sewer line on the outskirts of downtown Nashville, Tennessee. GPRS utilized a 270 MHz ground penetrating radar antenna to search for the massive sewer. GPR is a great tool to locate underground utility lines including electrical and telecommunications conduits, water and irrigation lines, sewers, and other obstructions. GPRS project managers can help you locate underground utilities on your job site, keeping you and your crews safe and productive while safeguarding the assets of your customers. Ground Penetrating Radar Systems, LLC. 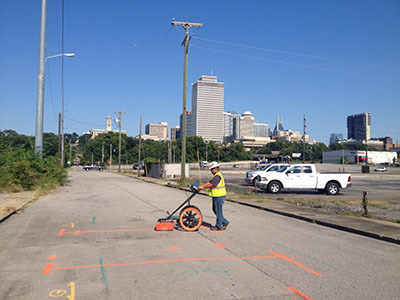 provides GPR services nationwide and have offices located throughout the state of Tennessee, Arkansas and Mississippi including: Nashville, Knoxville, Chattanooga, Memphis, Little Rock, and Jackson. Matt Johnson serves as a Regional Manager for Tennessee and can be reached at matt.johnson@gprsinc.com or by phone at (615) 418-4023. GPRS also performs other applications that include: mapping of electrical conduits, detection of sub-surface voids, utilities and detection of underground storage tanks (UST’s).